You download an ebook and open it up on your computer. Hours of work and research flood out. It overwhelms you. Don’t you wish you could do something like that? But you can’t. You know you can’t. It requires years of graphic design school, software you can’t afford, a team the size of your whole business and time you don’t have. And it would be so good too! Leads would flood in and your brand awareness and sector authority would skyrocket. What if there were a way to make an entire ebook in a single day? One that looked beautiful, held valuable content and was worth every single lead it got? There is. I can show you how I do it all the time. The best way to write an ebook that your target audience will download is to write an ebook that covers exactly what they’re thinking about. The best way to find that out (unsurprisingly) is to ask them. Send out a mass email to your merchants and existing leads. Ask them to fill out a simple multiple choice questionnaire with three or four of your best ebook topic ideas. Honesty right from the get go. Tell your email recipients exactly who you are and what the email is about immediately. Let them know how much time your request is likely to take them to increase the chance of engagement. A casual tone develops/continues the relationship with your contact and keeps them reading. 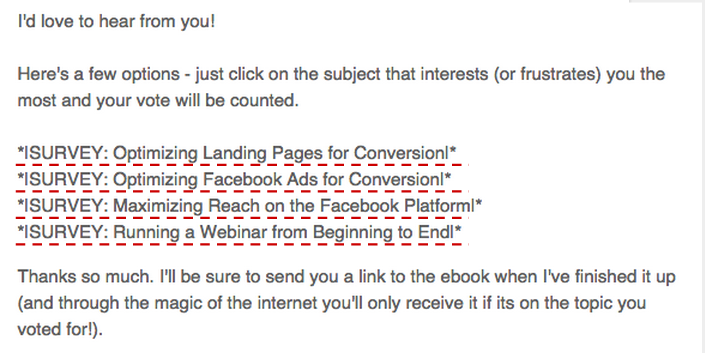 Keep your ebook subject options between three and five to ensure you don’t overwhelm your email recipients. In order to create a poll in an email on the Mailchimp platform simply put your ebook subject ideas within the survey merge tags, which look like *|SURVEY: [your subject idea]|*. Here’s what it looks like within the Mailchimp campaign builder. Another great strategy to ensure you’re creating an ebook that your target market wants to read is to post a simple poll on your website or blog. There are a bunch of great Wordpress poll pluginsout there or if you use Blogger, here’s a simple how-to guide. Not only will placing a poll on your site and sending an email blast get you the information you need before you start creating your ebook, it will also generate serious buzz about it. Once you’ve decided on a topic for your ebook you need to find and create your content. Your blog articles are a goldmine of original content. If you’ve been blogging for a while, it’s likely that you have enough content on any given subject to create an ebook on it. Take a bit of time to read over the articles you have and pick and choose those which, when compiled, would flow best together. Provided you credit your sources adequately, you don’t need to create your own industry report to find statistics or interview thought-leaders to find quotes. This stuff is out there on the internet just waiting for you to use it in your ebook to generate leads. I know I could write an entire ebook with this statistic, discussing the waning power of offline promotional strategy and comparing it to three or four online alternatives such as paid search ads, social media advertising, content marketing and SEM. I also know that I could integrate existing content from articles I’ve already written about Facebook advertising, content marketing best practices and ROI, Google remarketing, etc. This would save me huge amounts of time and energy, as I’ve already done the research and re-use would require only minor tweaks. Does your favorite ebook look incredible? Steal its design elements. Do you think you could add insight or experience to an existing resource you love? Recreate it. Here’s where you have the option to either purchase Photoshop (currently retailing for the same price as your mortgage) and go to night school yourself, or hire a graphic designer (about $40,000+ a year). There is. 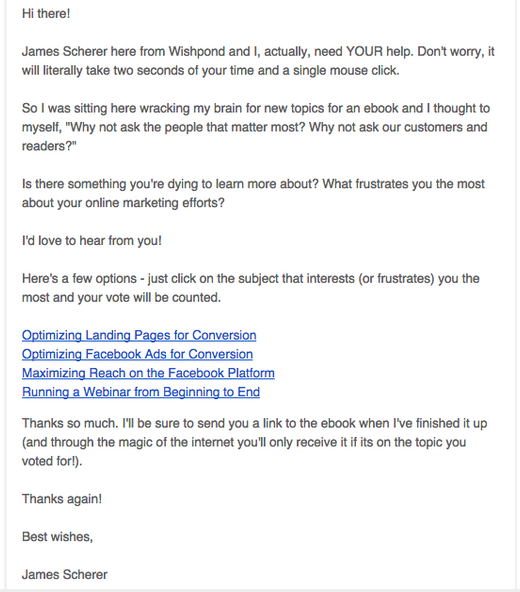 I use it every day, and with it I’ve created ebooks that have generated thousands of leads for Wishpond. Copying these pages will allow you to create a full ebook which matches in style and design. I’ll break down the creation of this 9-slide ebook below, but know that everything you see was created through a combination of GIMP (free photo-editing software) and Google Slides. 1 . Brainstorm a colloquial primary title, and join it with a more specific subtitle to both engage and inform. It helps to create personality and makes your readers feel included in your special club. 2 . Keep the design elements of your title page simple and the title itself prominent. 3 . Be sure to feature your business name and logo on your title page (even if you don’t do it anywhere else). As the most memorable page in your ebook you want your brand to be prominent. 1 . Brainstorm a catchy and memorable tagline for your ebook.It helps to create personality and makes your readers feel included in your special club. 2 . Find a quote or stat which frames the most basic concept of your ebook. Try to find one from a recognized influencer or from within your own business. 3 . Choose two fonts for your ebook. One for all headers and another for all body copy. In this ebook I’ve used Raleway for headers and Arvo for body. 4 . Include a brief blurb which introduces the concept and subject of your ebook. 1 . 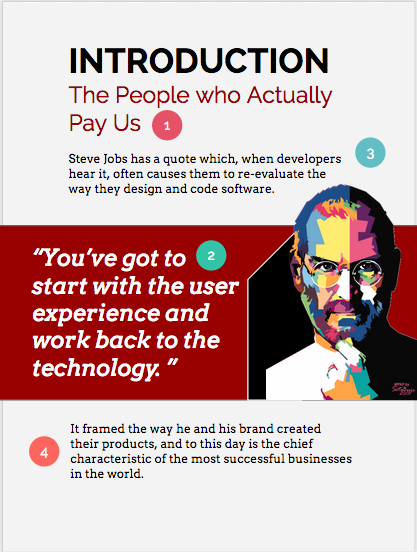 A personal introduction to the ebook from its author or your company’s CEO gives context and reason behind its creation. 2 . Subtle and recurrent background image which keeps your ebook’s pages from being solely text (and therefore unengaging). See re-use on Page 7 and 9. 3 . Include a quote which backs up the point you’re making. This increases trust between reader and author. 4 . A signature gives personality and cements the relationship between author and reader. 1 . Page numbers create cohesiveness and can be linked to the chapter itself (allowing for readers to quickly find sections they want). This increases the chance of your ebook being seen as a resource to keep around and return to. 2 . Simple and recognizable icons give your table of contents a bit more character and (when used again) cohesiveness down the line. 1 . Recurring icon creates consistency and cohesiveness (as well as adding a visual element). 2 . Body copy is aligned identically on each page by copying the previous slide’s textbox and pasting it. Simply remove the existing text and the box will stay in the same place. 3 . 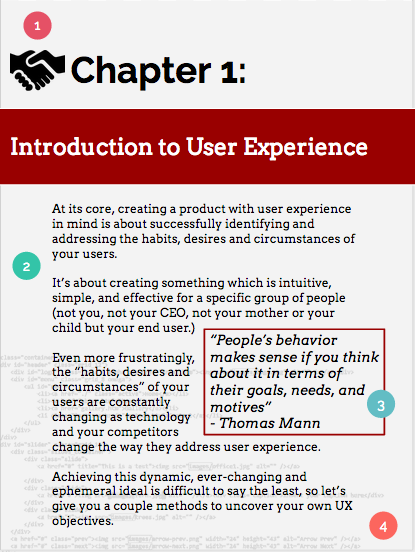 Quotes that support the concepts in your ebook should generally be larger and set apart. This creates a professional and dynamic feel in your ebook. 4 . You’ll notice I haven’t included page numbers at the bottom of the pages themselves. This is a matter of personal choice. I find it difficult to make them look visually appealing on each page, and almost every ebook reader includes them automatically anyway. But try it for yourself! 1 . Where possible, place your subheaders and paragraphs in the same place between pages. For instance, Slide 6’s first subheader is aligned horizontally and vertically exactly as Slide 7’s. This creates continuity and visual appeal. 2 . Rather than copying and pasting graphs or charts into your ebook, try recreating them in Google Slides itself. This doesn’t take long and keeps your design elements and formatting consistent. 3 . 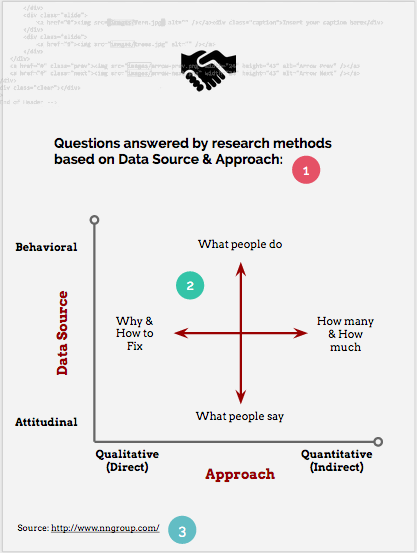 You can choose if you will source your statistics and findings on the page itself or in a “sources” page at the end of your article. This is a matter of personal choice and your design goals. 1 . 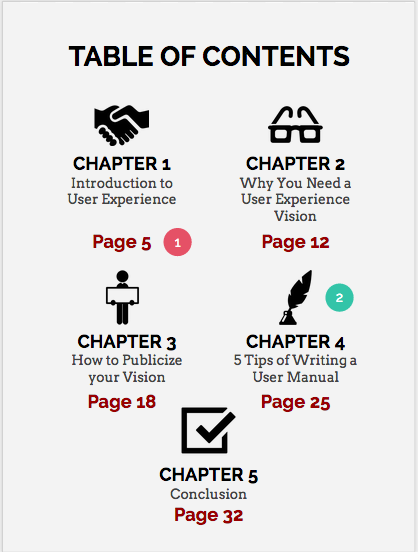 The chapter’s icon is more than enough to convince readers that they’re in the right place. 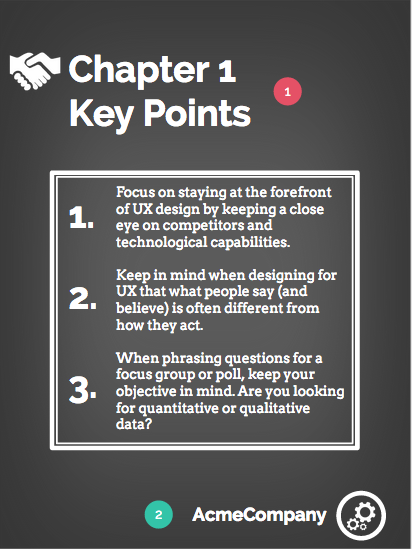 You don’t need “Chapter 1” on each slide. 3 . Err on the side of less text on your pages. 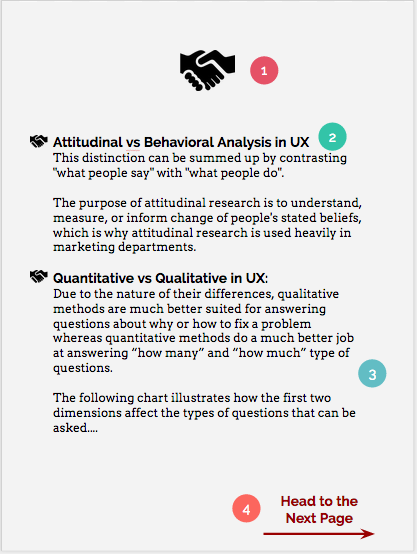 Forcing too much information (for instance, trying to fit the alluded-to chart onto this page) makes for a visually unappealing and crowded ebook. 4 . 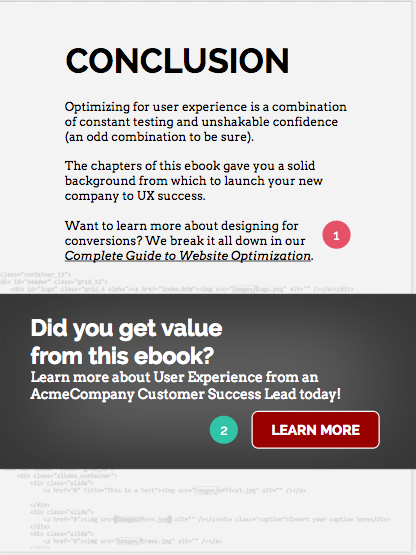 Test the addition of directional cues to increase the flow of your ebook or to add emphasis. 1 . A two or three-point wrap up or takeaway slide provides value for your readers. If you like, make these short, catchy key points Tweetable. Here’s a simple walkthrough of how to do that from our friend Mike Allton. 2 . 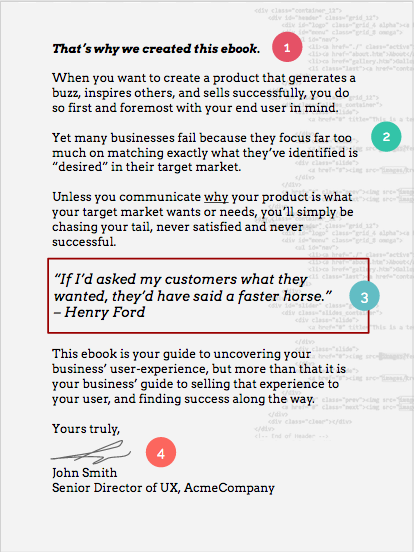 Place occasional (though not random) branding on the pages of your ebook. This reminds people whose valuable information they’re learning, and also increases brand recognition and awareness. 1 . Use your conclusion page to not only wrap up your ebook’s subject, but also to encourage your lead’s continued travels within your sales funnel. Promote a secondary and related ebook, webinar, or sector report. 2 . After receiving all the value of your ebook, your new lead has never been warmer. Don’t waste this opportunity for sales promotion. Include a Call-to-Action for a VIP demo or sales call that contrasts with the rest of the page. Google Slides is an incredibly versatile platform, and is becoming more so every day. It allows for easy photo editing (cropping, coloration, transparency, resizing, etc) as well as text, shapes, and easy exportation. To be honest I could discuss the strengths of Google Slides for another couple paragraphs or you could just take my word for it and explore the platform yourself. As with every new platform, I recommend playing around with it before diving straight in. Of course a design background will help, but it’s by no means necessary. Remember, if you’re stuck for inspiration or frustrated at your end results, head back to the drawing board or examine other people’s awesome content and try to recreate it. Next week Claire Grayston will dive into creating an optimized landing page for your ebook that will generate leads for your business. She’ll also get into the six best ways to promote your ebook. So stay tuned for those. 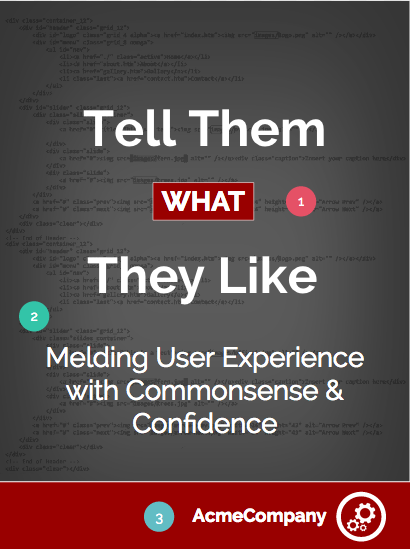 Hopefully this article has caused you to question your assumptions about ebook creation. It’s easier than you might expect, and exactly as valuable as you think. If you have any questions or want to share an experience with ebook creation or lead generation, don’t hesitate to comment below. Update: Check out Part 2 and Part 3 of this short series, which break down how to design an optimized ebook landing page and also how to promote your ebook to success online.